Our vision is to reflect and respond to the world through dance: enabling artists of all backgrounds to create dance that moves us and opens our minds; sharing those experiences with the widest possible audiences to enrich their lives and deepen their understanding of what it means to be human. 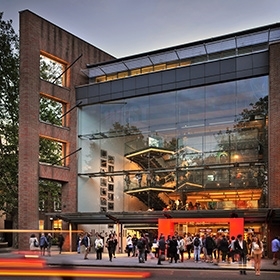 Sadler's Wells is a world-leading creative organisation dedicated to dance in all its forms. With over three centuries of theatrical heritage and a year-round programme of performances and learning activities, it is the place where artists come together to create dance, and where we welcome everyone to experience dance – to take part, learn, experiment and be inspired. Audiences of over half a million come to our London theatres each year, with many more enjoying our touring productions at venues across the UK and around the world, or accessing our content through digital channels. Sadler's Wells commissions and presents more new dance work than any other theatre in the world, embracing the popular and the unknown. Since 2005, we have helped to bring over 150 new dance works to the stage, many of them involving our 16 Associate Artists, three Resident Companies and four Associate Companies – the most exciting talents working in dance today. Sadler’s Wells supports the development of dance artists and choreographers at every stage of their career. We give the next generation of artists the means to develop further through programmes such as the National Youth Dance Company; Wild Card; New Wave Associates; Open Art Surgery; and Summer University. Through the support network at Sadler’s Wells, they are able to seek out new ideas and collaborations. Sadler's Wells' learning and engagement activities take dance out into the community and invite communities into the theatre, generating over 34,000 attendances annually. Our schools programmes offer access to dance, both in and out of school. There are also opportunities for people of all ages, abilities and backgrounds to take part in high-quality productions and learning opportunities, both on and off our stages. The renowned Company of Elders is our resident over-60s performance group, and our annual events range from pre and post-show talks with dance artists to classes, workshops and assisted performances. Find out more. Sadler's Wells is a registered UK charity. Whilst we receive 9% of our revenue from Arts Council England, we must raise the remaining 91% ourselves. The majority of our income is generated through ticket sales, complemented by commercial income from secondary spend and venue hire; and fundraising from individual donors, trusts and foundations and companies. Find out how to support us.